While hiking from PSR to the dunes in Panamint Valley I swerved over to the mouth of Rainbow Canyon aka The Jedi Transition and was dazzled by several sets of jets zooming up and down the canyon and out and about the valley. I realize military aircraft inside a national park has controversy but I can't change that so I enjoy the show. My photography is not professional and is not the best but it will just have to do. These jets are so fast and the sound is hard to tell the direction so I feel lucky capturing them at all in my viewfinder, let alone trying to zoom in on them from far away. I'd love to take a ride in the back seat of one of these flying machines! Wow, you got some great footage - thanks for sharing it. By the way, why is it "the Jedi Transition"? Low level training route for military aircraft that goes from the Owens Valley to the Panamint Valley roughly following the 190 and entering Panamint Valley via Rainbow Canyon. 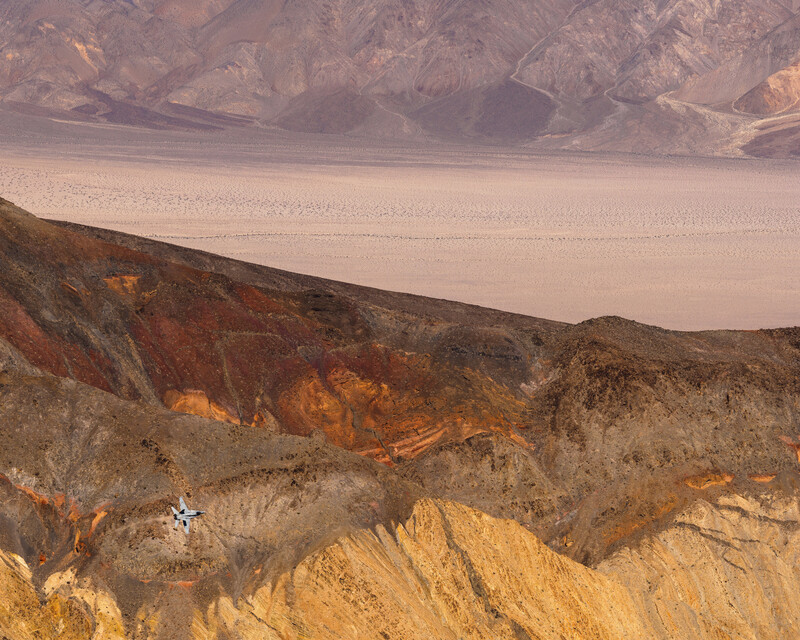 Pilots refer to Rainbow Canyon as "Star Wars Canyon". There is a larger training loop up Owens, down Eureka, Saline and Panamint. It can be short circuited by crossing over the Inyos at the 190. That short cut is a called the "Jedi Transition" as another Star Wars reference since it involves flying down "Star Wars Canyon". Rainbow Canyon is viewed from Father Crowley Point along the 190. Jets have flown down it for decades. 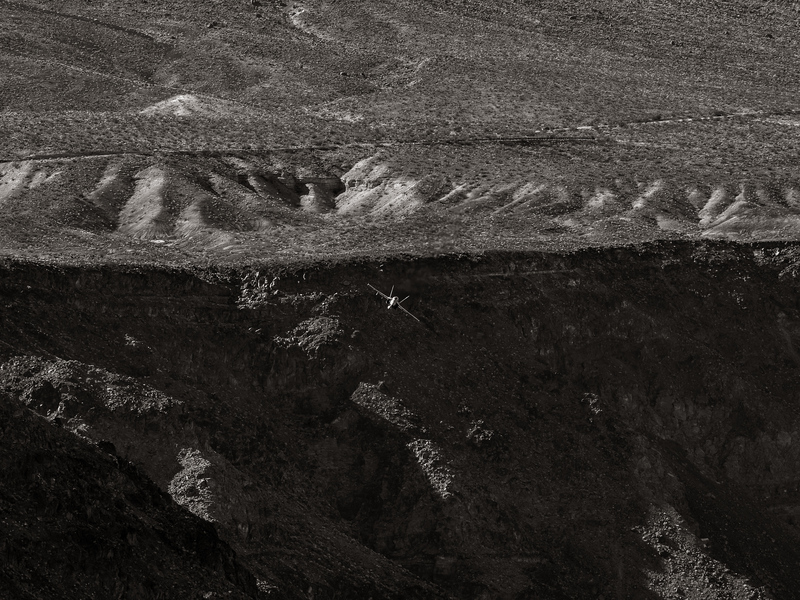 Sometime in the past five or so year the internet finally discovered this and now Father Crowley Point is typically crawling with aviation buffs trying to video/photograph jets in the canyon. A poor cell phone video of a flight from when I happened to stop by this fall on the way to a hike. Hey kwalsh, thanks for the concise summary of Star Wars Canyon and The Jedi Transition, and your lovely images. So far I've captured images of the low flyers from Father Crowley, the butte high above the west entrance of Rainbow, the flats above the dry fall at the west entrance to Rainbow, the north ridgeline of Rainbow across the canyon from Father Crowley, and from the east entrance (mouth of Rainbow Canyon). I want to spend an entire morning at the mount of Rainbow atop a knoll that sits smack dab a the exit point. It's about a two-mile hike one way from PSR so I hope that I get lucky with many pass overs. I have plans for still another location that I won't disclose yet, pending a successful outing in the next year or two. This video at minute 7:11 shows flying down Rainbow Canyon from the pilot's perspective and is quite the thrill.